Because of this, in FastRawViewer versions 1.3.0 – 1.4.6 we used a different, free of those inconveniences, method for selecting files; there is a thing with it, however: to add a file to selection one needs either to use Ctrl-Click, or to click on a checkbox in the upper right corner of the thumbnail. Starting with FastRawViewer version 1.4.7, we also support the standard method of selecting files, the same as the one used in Windows Explorer/Mac Finder. 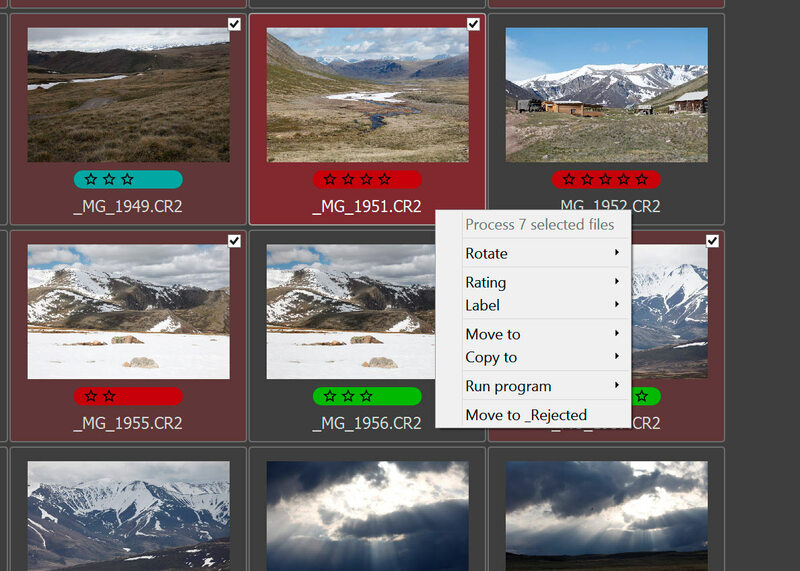 To switch to this mode, uncheck the box in Preferences – Grid/Filmstrip – Advanced selection mode: accidental click does not ruin selection. Ctrl-Click on the file preview thumbnail. Set a checkmark in a checkbox in the upper-right corner of the preview thumbnail (the checkbox appears for the files that are currently unmarked when you hover a mouse over its preview; the checkbox is permanently visible for those files which are already marked). (the behavior of Shift-Click can be changed through the hidden setting ShiftClickSelectionMode, see the “Additional Setting” section below). 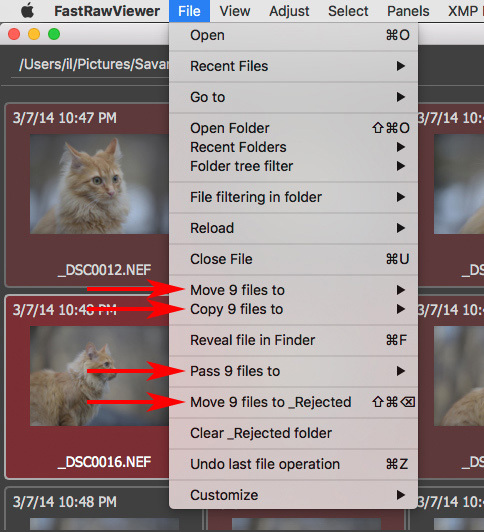 (De)select and move to next – reverses the mark status and navigates to the next file. Move to prev. and (de)select – navigates to previous file and reverses its mark status. Select All, Invert Selection, Deselect All. Save Selection to file – saves the list of marked files to a text file on the disc. Load/Append selection from file – loads the list of marked files from the previous bullet and marks the corresponding files for the load operation or adds to the list of the currently-marked files for the append operation. 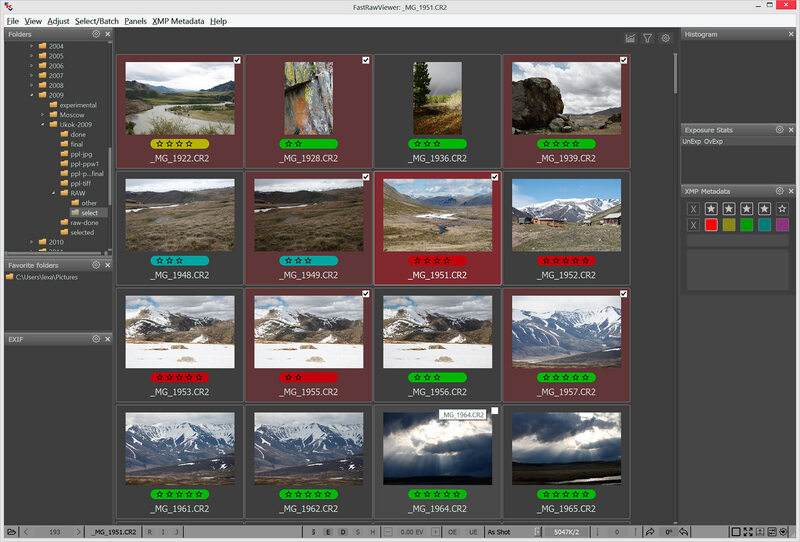 This color can be changed through Preferences – Interface – Selected files background. To allow XMP operations, disable the setting "XMP settings - Disable batch XMP operations if files with same name are selected". 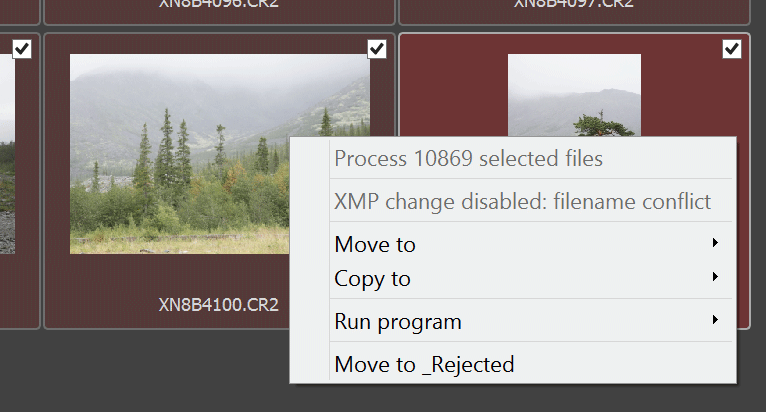 If it is turned off, the XMP files will be created for all selected files, but because of the name conflict only the last recorded file will contain actual data. Shift-Click, Shift-arrow – extends the selected area. When clicking on any of the selected files, a context menu that displays possible actions over the group appears. Starting with version 1.4.6, FastRawViewer uses the same hotkeys/menu items for operations with several files as for single files. If the selected group has identical ratings/labels, then the corresponding snowflakes/borders will be highlighted (picture below, on the left), if they’re non-identical (or unknown, see the next point), then they won’t be (on the right). 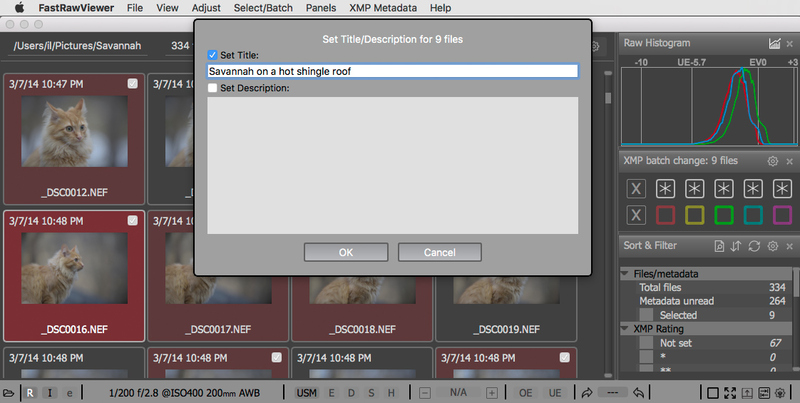 If they are the same for all selected files, then a field that matches the contents of all of the files will be displayed in the XMP/Metadata panel. If they are different (or unknown because the metadata hasn’t been read), multiple values is displayed there instead. The check for one button is assigned to several actions happens at the start of the application. To do so, in Alternate multiple files processing mode (see next chapter) use the default menu (XMP Metadata), the default hotkey (Alt-D), the context menu for a file group, or by clicking on the Title/Description space in the XMP Metadata panel. Actions over groups of files appear in the menu. The “one button is assigned to several actions” check that runs at program start. Under default settings, no group action has any hotkey, they will need to be set manually. The behavior of context menus doesn’t change. After cancelling a move operation (to another folder or into _Rejected) for a group of files, the original rating for that group will be restored. When cancelling other operations, the rating will not be restored.